Hide yo' kids, hide yo' wife—for the first time in a while, we're going to be in Miami for a whole month and we're going to be out in full force rekindling our love for Miami's bustling social scene and its love for us. Below we highlight nine can't-miss events we're planning to attend. We hope you'll join us in taking advantage in the flurry of upcoming Miami events and that you'll say hi. We've missed you! On April 1, O Cinema Wynwood will debut City of Gold, a documentary chronicling Pulitzer Prize-winning food critic Jonathan Gold's nationally-recognized style of criticism through his relationship to his hometown of Los Angeles and the food experiences he's discovered therein. Tickets range from $7.50 for members to $11 for general admission. Also on April 1, Coral Gables will host the grand finale of Giralda Under The Stars series, signaling the end of Giralda Avenue and its reconstruction into the new-and-improved Giralda Plaza scheduled to open late this summer. Join us in celebrating the future of Giralda (and The Local's 5th birthday!) with outdoor dining, entertainment, and live music including a performance by Miami New Times' "Miami Best Band" the SunGhosts from 7 p.m. until midnight. Miami Music Week may be over, but on April 3 the Little River District's soon-to-open culinary and design hub, The Citadel, will be dropping a killer brunch line-up. The Ultimate Brunch will kick off their groundbreaking event with featured dishes by Miami favorites such as Bachour Bakery & Bistro, Proper Sausages, Pinch Kitchen, and Finka Table + Tap. Entry is free with registration, dishes start at $7, and drink start at $5. All praise the A&E District for bringing back the Miami Soul Train on April 6! We've seen the videos and photos from everyone having an amazing silent dance party on the Metromover and we're psyched we're getting a chance to finally check it out. Beware: you must register and headphones are first-come, first-served. When was the last time you attended an all-you-can eat event you didn't feel guilty about? Starting at 7 p.m. on April 7 Uncle Tom's BBQ makes it happen by letting you eat as much as you want and wash it down with a glass of wine or beer for $25 in the name of charity. Proceeds from the UTBBQ Cares 4 U event will provide free meals to the homeless and low-income families. #yaaaaas. If you're looking to center yourself, The Yoga Expo—the largest festival of its kind—is coming to the Fort Lauderdale Convention Center on April 16 to showcase unique styles of mind and body practice. For $25, your day pass connects you with local teachers, yoga studios in yoru area, and local sustainable food and drinks. The South Florida Bloggers will be hosting their monthly meet-up at Keyworking Miami on April 16 from 12 p.m. to 2 p.m. If you’re looking to learn more about sponsorships, join marketing guru Annabel Mendez of Marketites as she shares her insight on influencer marketing, how to get the attention of brands and more! Register here to attend for free. Leggings Lounge Yoga + Happy Hour makes its triumphant return on April 20 to celebrate its one-year anniversary at The Miami Beach Edition. The BYOM (Bring Your Own Mat) event will feature a complimentary one-hour yoga class hosted by our girl, D'ana of Collections + Volumes. Register here for this free event. The Miami Beach Edition is taking movie night to another level with their monthly screenings at the Sandbox (yes, a literal sandbox). 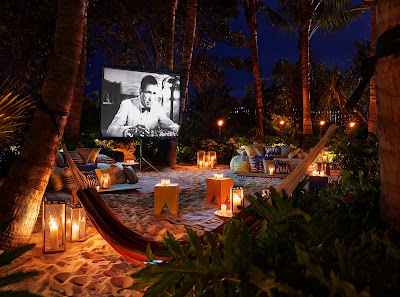 Only $150 gets you admission to their new Movies Under the Sand series and a picnic basket for two with mouthwatering bites from Tropicale like local vegetable crudité with lemon yogurt dip, Florida shrimp cocktail, kale salad with jalapeño and mint, gourmet popcorn, house-baked cookies, and a bottle of wine. The April date is still TBD, but keep your eyes peeled here for the insider scoop. Update: the date of the next event has been announced as April 16 and will feature film will be Key Largo starring Humphrey Bogart and Lauren Bacall. Which of these can't-miss events are you most excited to check out? What other upcoming Miami events can't we miss? Leave a comment below or send us a tweet @ThankYouMiami!